Skaneatelesans of all creeds received with sorrow yesterday the news of the passing of their friend of many years, Sister Mary Antonia, who died in Mercy Hospital, Auburn (Wednesday, April 10) at 4:45 p.m. She was 79 years of age. Sister Antonia was a familiar figure to the citizens of Skaneateles and her religious garb of black and white was respected by all. Everyone called her Sister, and the children were her source of delight. 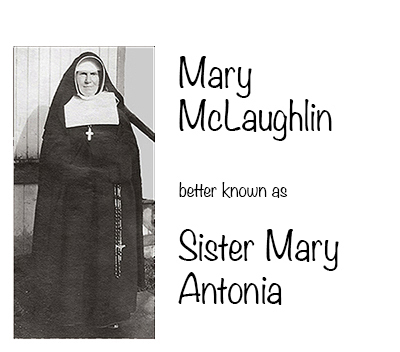 Sister Antonia was the first child of William McLaughlin and Mary McKeough McLaughlin. She was born in the Parish of Desertegney in County Donegal, Ireland, in 1867. As an infant of three months she was brought by her parents to the village of Skaneateles and the family was blessed with four more children, three of whom survive. SISTER ANTONIA was a graduate of the Skaneateles High School in 1887, and then taught school in the districts of Skaneateles and Marcellus. In 1890 she assisted the Sisters of St. Joseph at St. Patrick’s School in Rochester. Monsignor Derrigi, a native of Belgium, was pastor of St. Patrick’s Cathedral and noting the religious aspirations of Mary Ann McLaughlin advised her to enter of Convent of the Daughters of Mary in the village of Willbroeck, Belgium, a little village midway between the cities of Antwerp and Brussels. In 1896 she sailed on the Westerland and there remained until the war of 1914. The invasion of Belgium by the Germans caused her to seek refuge in London where she was furnished money by the American Consul to return to Skaneateles. ONE OF THE GREAT events of her life was the meeting with Cardinal Mercier of Belgium on his visit to the United States. His defiance of the German military leaders is outstanding in the history of the Old World. In the late years of her life Sister Antonia assisted by clergy of St. Mary’s of the Lake Church in the Confraternity of Christian Doctrine. She was beloved by the children and her memory will be a cherished one. Sister Antonia is survived by a brother, John, of Jordan, two sisters, Anna and Elizabeth of Skaneateles. "After escaping to England, she went to the area of Leeds where the McLaughlin family had the teasel business and took care of Belgian refugees who were housed by the people of Yorkshire, regardless of their religious affiliation. "She describes the great generosity of the English people of Yorkshire in assisting her and the refugees. It was a great assistance to everyone that Sister Antonia spoke Flemish, French and English fluently, in organizing this refugee effort in this area with the consent of the local English governing bodies. The narrative of this flight is documented in her book, 'From Convent to Conflict,' which was published in 1916. "Sister Antonia lived with her two sisters on Fennell Street in the first house south of St. Mary’s Cemetery. She is remembered always walking around the village, as she had no car. She obtained permission from the Bishop of Syracuse to remain here and teach religious instructions at St. Mary’s of the Lake Church. "I vividly remember Sister Antonia’s tiny stature walking up Austin Street with her black habit flying in the wind during the winter months, to unlock the side door at St. Mary’s Church to let us in for our religious instructions. Through her, I prepared for my First Communion." LONDON, Oct. 7, 2:45 P.M.: Sister Mary McLaughlin of Skaneateles, N.Y., was among several hundred refugees from the vicinity of Antwerp to reach London today. Together with fifty Augustinian sisters, she was driven from the Fille de Marie convent at Willebroeck, fifty miles south of Antwerp, by the bombardment of the fort at this place on September 29th. “We stayed at the convent as long as possible to protect the property, but the school being near the fort, shells struck our chapel and other buildings, shattering windows and wrecking the roofs. “Driven out, we made our way north to Boom, two miles away, where we were told we would be safe from German attack. Thursday we had to leave Boom on account of the bombarding. Finally we reached Antwerp, but were ordered to leave there immediately. We were unable to get a boat until Monday night. “I have been in Belgium for 18 years, but fortunately I have relatives in America to whom I can return. Some of our helpless sisters have been in the convent for 50 years. All the members of their families are dead, and until we can get back to our property and restore it, their condition will be deplorable. Sister Mary was met on her arrival in London by workers from the women’s relief committee. Arrangements are being made for her to sail for America next Saturday. Sister Mary McLaughlin is sister of Misses Anna and Elizabeth McLaughlin and Attorney W. J. McLaughlin of this town and Hon. John C. McLaughlin of Jordan. Sister Mary Antonia, the only American nun in the Augustinian Convent of the Daughters of Mary, Willebroeck, Belgium, and author of “From Convent to Conflict,” a recent book describing the German entrance into Belgium, is visiting her family in Skaneateles after an absence of nearly twenty years. Before becoming a nun, Sister M. Antonia was Miss Mary McLaughlin of Skaneateles and was graduated from Skaneateles High School in 1887. When German shells crashed into the chapel of the historic old convent on the outskirts of Antwerp, the sisters realized that no longer could they minister to the wounded soldiers and the faltering refugees who passed along the road before the steadily advancing invading armies. The scenes which she and her sisters witnessed in the days that intervened between the opening of hostilities and the final abandonment of the convent afford the principal foundation for Sister Antonia’s book. The profits from the sale are to be devoted to the rehabilitation of the convent in Willebroeck and possibly to the establishment of a similar school of the same order in this country. Practically the entire manuscript was prepared by Sister Antonia at the home of her family in Skaneateles. While she was in England, assisting in caring for the Belgian refugee families who were sheltered by the British, she made many notes of occurrences and scenes of importance which she preserved. They were of great assistance to her in preparing her book. Before the book could be published it was necessary to obtain the consent of the superiors of the order, and because of the difficulty in communication, several months were lost. Most recently Sister Antonia discovered that she could get into communication with her superiors through some of the soldiers’ bureaus for the distribution of mail. She finally obtained full consent from Rt. Rev. Bishop De Waechter, vicar to Cardinal Mercier. Sister Antonia said yesterday that while her plans are still somewhat indefinite, she expects to return to her old convent at the close of the war. She has permission to remain in this country until the cessation of hostilities, but it is not improbable that she will remain here if a convent is established by the Augustinian Order in this country.